Protesters at a rally at O’Hare International Airport on Tuesday. Various Chicago organizations gathered to demand accountability from United Airlines after a passenger was forcibly removed from a flight last weekend. 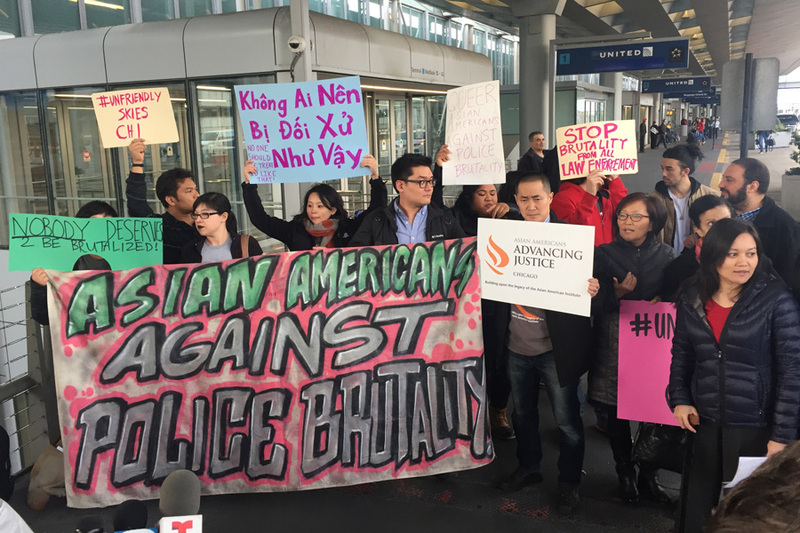 Organizations representing Asian Americans and immigrants in Chicago gathered at O’Hare International Airport on Tuesday to demand accountability from United Airlines after a viral video showed a passenger being forcibly removed from a flight this past weekend. Speakers from numerous organizations — including Asian Americans Advancing Justice-Chicago, the Council on American-Islamic Relations Chicago and the South Asian Bar Association of Chicago — joined U.S. Rep. Jan Schakowsky (D-Ill.) to call on United to make changes after the removal of David Dao, a Vietnamese-American doctor. Schakowsky said the forced removal of Dao was unnecessary and that she is considering introducing legislation to prevent the involuntary removals of passengers who have already boarded. Video captured by passengers on the flight quickly spread across social media this week, showing Chicago Aviation Police officers on Sunday dragging Dao off of a United flight that was scheduled to depart for Louisville. The incident occurred after the airline asked passengers to voluntarily give up their seats for compensation so four United crew members could get to Louisville to work an upcoming flight, United spokeswoman Maddie King told CNN. When no passengers volunteered, the airline picked four passengers to give up their seats based on connecting flights, check-in time, ticket class and wait time for the next available flight, another United spokesperson told CNN. Three of the selected passengers left the plane, but Dao refused to give up his seat, according to United. At that point, the CAP officers — who are part of Chicago’s Department of Aviation — removed Dao from the plane by dragging him down the aisle. One of the officers involved in the incident was placed on leave Monday. Dao suffered injuries to his face and was taken to a hospital for treatment. Tuyet Le, executive director of AAAJC, said the incident involving Dao is representative of systemic police mistreatment of minority communities in Chicago and nationwide. She called for a further investigation into United’s handling of the situation and the officers’ actions. Munoz said he would review United policies to prevent similar incidents from occurring in the future and vowed to “do better.” The review of policies will be presented by April 30, Munoz said in the statement. The U.S. Department of Transportation said in a statement Monday that it is reviewing whether United followed proper procedures in dealing with passengers who do not volunteer to give up their seats.